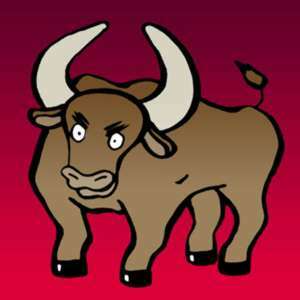 I have come across some legends about cows and bulls, but the special mention of color, like the RED or BLACK cow . . must have some deeper meaning.
. ushi oni, ushioni, gyuuki 牛鬼 "bull-demon" ox ogre . a monster in the pandemonium of Western Japan. the Akaushi (Japanese Red), the Kuroushi (Japanese Black), the Japanese Polled and the Japanese Shorthorn. 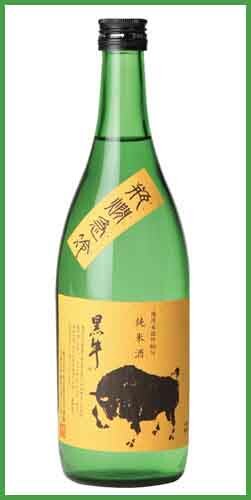 Kuroushi Junmai Ginjo from Nate Shuzo-ten Co., Ltd., long standing brewery in Wakayama Prefecture, epitomizes this hot new sake taste . . .
“Kuroushi goes great with a wide range of flavors, even with western cuisines. It’s especially amazing with cheese! So, I recommend baked dishes topped with cheese,” says Mr. Keita Akaboshi of Sake Bar Kirakuya. - Now let us go back to the past and enjoy some legends about "black cows". Since most farmers in former times used cows for the field work, I use that translation. Oxen and bulls were kept by specialized farmers for breeding.
. Buddha Statues and Cows (Bulls, Oxen) . 飯盛山 Mount Iimoriyama was called 弁天山 Benten-yama, because deep in the mountains there was a small shrine to venerate the deity Benten. It was so far away from human habitation that the villagers of 滝沢村 Takizawa decided to have a new hall build nearer to the village. Every day one person from each farming family, about 50 persons, began to work there for more than two months and finally the hall was finished and a large banquet was to be held in the evening in the precincts. But during midday there was suddenly the voice of a cow to be heared. When the villagers went to have a look, there was a beautiful girl riding on a black bull. She held a bowl filled with red auspicious rice in her hands and stopped at the village center. She was so beautiful that all folks were stunned at her sight. "Thank you all so much for building this wonderful temple hall. As a thank-you gift I offer you this bowl of red rice!" "Where did you come from?" asked the villagers but she just told them to eat the rice and smiled beautifully. So they begun to eat and had never tasted anything better. "That's so good, how delicious, how delicious. . . " and the more they ate the more the bowl filled again and was never empty. They ate and ate, thinking it a bit strange but did not worry until all were filled to their heart's content with rice. Then the girl took the bowl, placed it on the back of the cow, said "Thank you for accepting my humble gift" and left. The villagers looked after her in surprize, but after a few hundred meters her figure simply vanished from sight. "What a miracle, this must have been Benten Sama herself" the villagers finally realized. 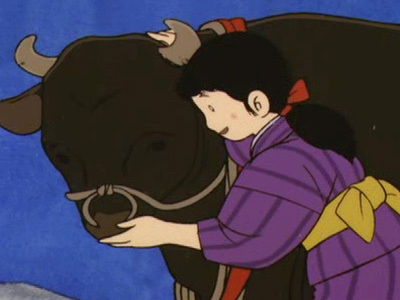 And where the cow had suddenly disappeared they build a grave and shrine for the cow 牛の墓. 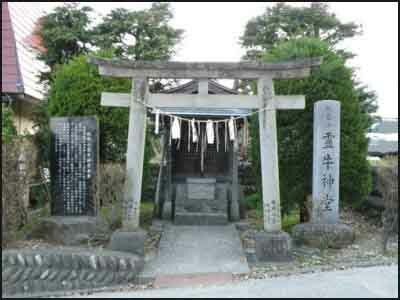 This is the origin of the village name Ushi-ga-Haka 牛ヶ墓 "Grave of the Cow" , 牛ヶ墓村 to our day. And the mountain where Benten gave them all a never-ending portion of red rice was now called Iimori Yama 飯盛山, "The Mountain of a Large Portion of Rice". The master of the 黒淵 Black River Pond is a black cow with white spots. It does not like smoke. When it shows its head to the villagers, there will be a severe drought in the villatge 大旱魃. The villagers have to go to the River Pool and perform some rain rituals. On January 10 in 1900, a hunter of wild boars went to the mountain forest on the day of 山神祭 the festival for Yamanokami. He took a rest at the path where the wild boars usually walk. There comes a large wild boar, but as he aims and pulls the trigger, the boar suddenly becomes invisible. 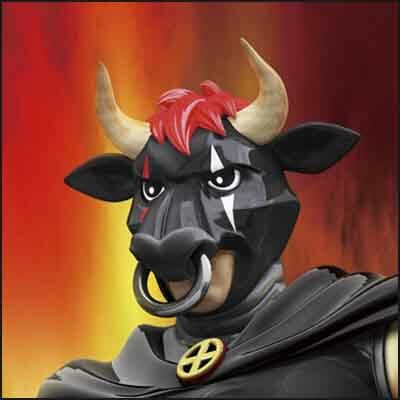 Now a huge monster like a black bull appeared, gallopping fast, making furious sounds. The hunter fled the scene in great fear. there lived a man who bred black bulls for bullfighting 闘牛. At a place called Kuyamajii くやまじい there is a 化け物 monster called 黒牛 Kuroushi. A sinful woman left a piece of cloth to dry in the garden behind her house, but a passing cow snagged it with a horn and trotted off. The woman followed the beast all the way to Zenkooji, where it disappeared and she found herself standing before the image of Amida Buddha. From that point on, she became pious. a beautiful lively girl lived here with her mother and father, who was a woodcutter. The girl took care of the cows in the open pasture from Spring to Autumn, although she was still very young and would rather play with other children. One day a black calf was born in the herd. It grew up happily and joyfully in the care of the family and survived the fierce winter. But then its cow mother died. So the young girl took good care of the calf now all by herself. Within two years, the calf had grown into a beautiful ox with black hair, strong horns and four strong legs. His black hair shone even more beautifully than that of the other cows in the herd. The young girl would often climb on its back and take a ride through the forest. One night in summer, the girl took the black bull to view the moon reflected in lake Kamoko. On the way back, when the girl turned once more toward the lake, she found a young man standing behind her. "I am the bull you have raised so tenderly. In summer, when the moon reflects in lake Kamoko, I am allowed to turn human. Oh, I love you so much!" From that day on, the girl took the bull to the lake every night and the two could enjoy their time together. The girl was also deeply in love. In the winter of that year the parents decided it was time to sell the black oxen, but the daughter would not have it. So they sneeked out at night when the girl was asleep, took the bull and went to sell it. The girl tried to run after them when she woke up, but she came only to the mountain pass. There she fell down, red blood streamed out of her mouth and she died on the spot. In spring the farmers planted a shakunage 石楠花 rhododendron bush on the spot at 大倉峠 Okura Pass where the girl had died.
. Reference - 黒牛伝説　.